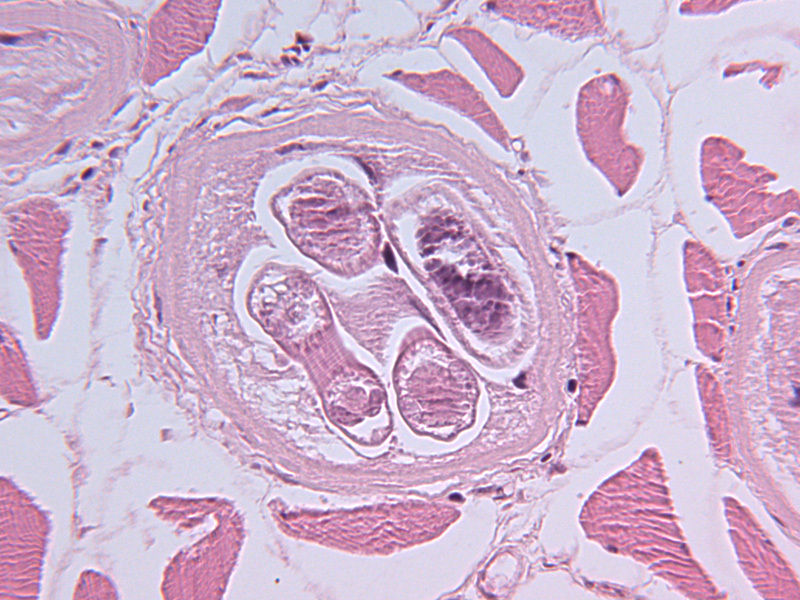 Trichinellosis, a severe disease in humans, is caused by an intestinal nematode, Trichinella spiralis. The infection is transmitted by eating raw or undercooked meat with encysted larvae. Many domestic and wild animals – in temperate zones mainly pigs – serve as a reservoir. After per oral uptake of infected meat and gastric digestion of the cysts, larvae develop very rapidly in the subepithelial tissue of the small intestine. After four moults and mating of adult worms, gravid female worms (3–4 mm in length) reinvade the mucosa. They start releasing larvae in the mucosa from day 4 post-infection. Larvae (about 100 µm long) enter the bloodstream, are disseminated throughout the body and enter the muscle tissue where they become encapsulated within 4–5 weeks post-infection. The infective larvae (about 10 mm in length) survive for many weeks in the cysts. Their calcification begins after 6–12 months.